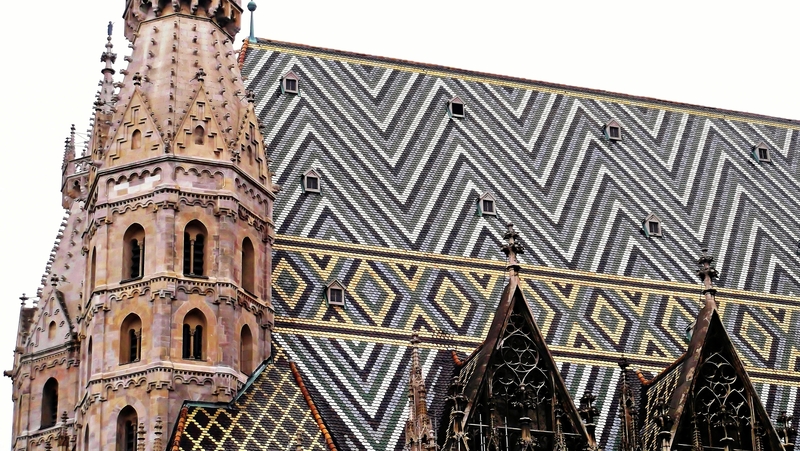 The Roman Catholic St. Stephen’s Cathedral, which is referred to as Stephansdom in German, is situated in the capital of Austria, Vienna, right in the Stephansplatz. 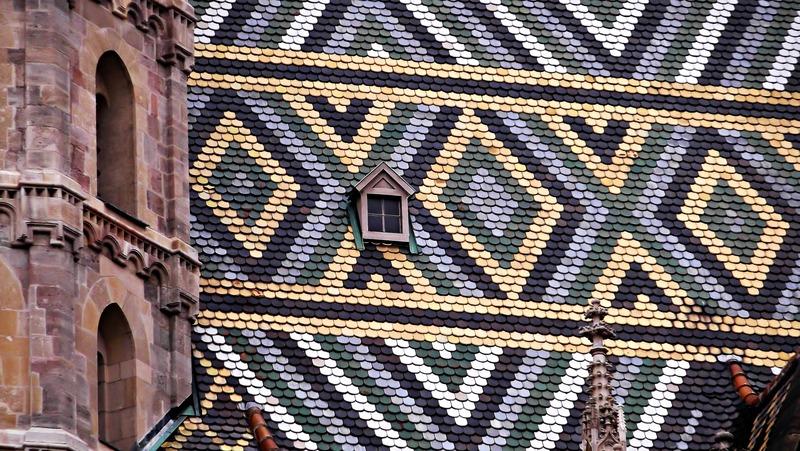 Its striking interior and multi-coloured tile roof have become the landmark of downtown Vienna. To many of us, places of cult represent inner and outer depth. 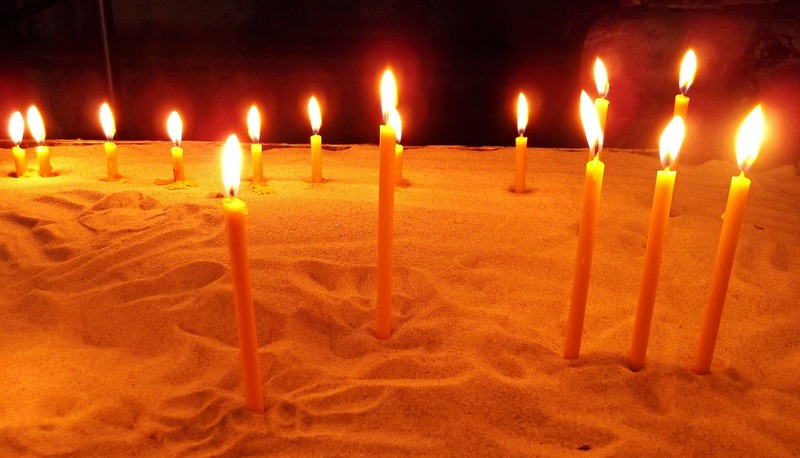 Especially Gothic cathedrals were constructed to depict the light of Heaven. The vaulting was so high, the stained-glass windows irradiated the whole space, everything was designed to create a sense of transcendence. 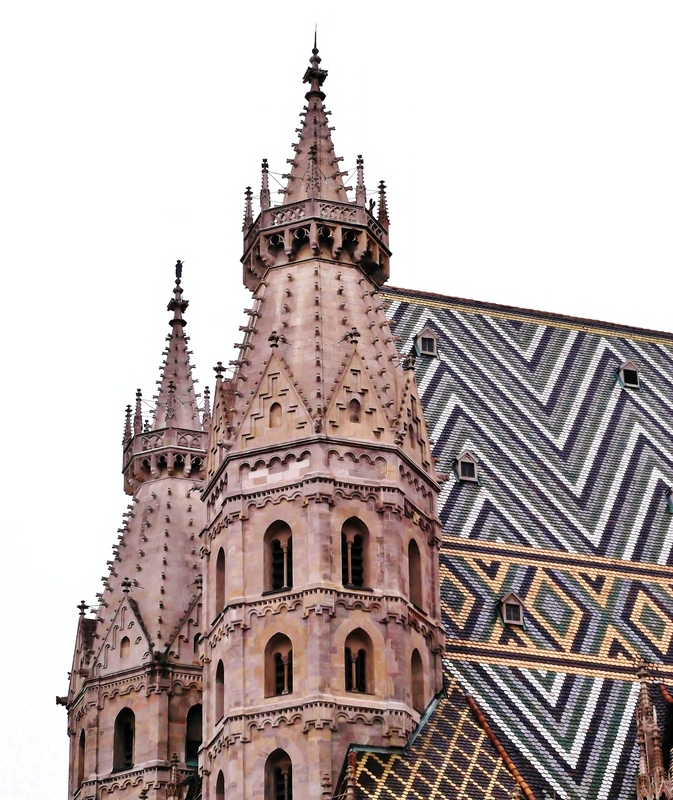 St. Stephen’s Cathedral in Vienna is one of the most beautiful cathedrals in the world, rightfully attracting a constant stream of visitors. 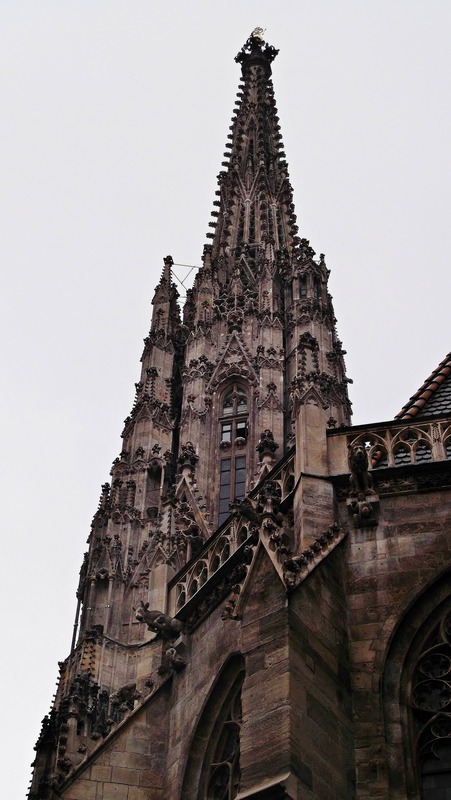 As many imposing Gothic cathedrals, St. Stephen’s Cathedral was not built in a day. Actually, its construction started out in the 12th century, and repair and restoration works continue to the present day. 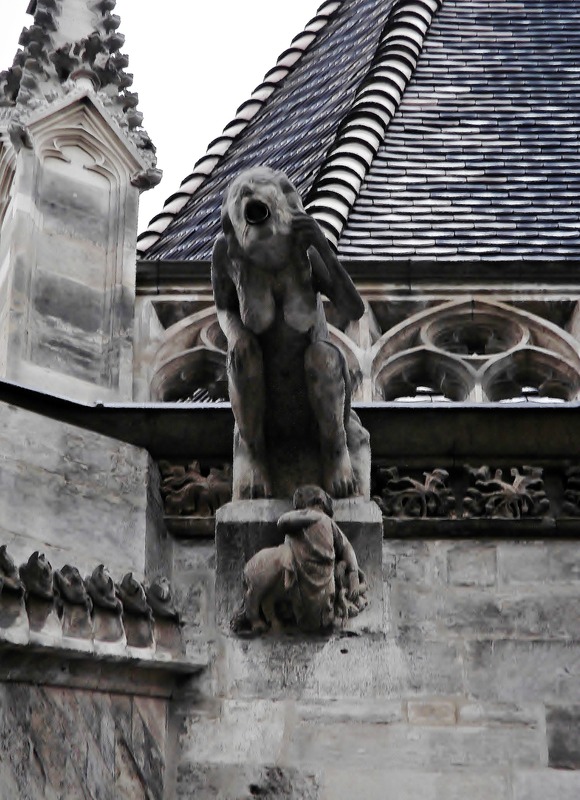 And as any other really old cathedral, it has a history of natural and man-made destruction, demolition and rebuilding. 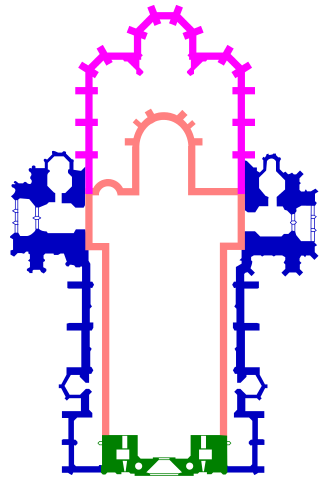 The current Romanesque and Gothic form was largely initiated by Duke Rudolf IV (1339-1365), and stands on the ruins of two earlier churches. 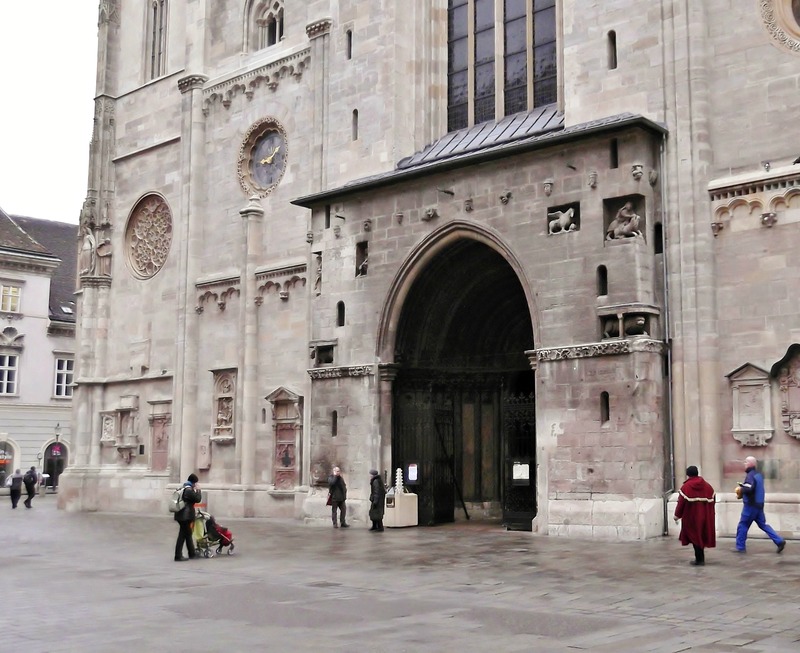 Growth of the Cathedral, showing the Romanesque towers and Giant’s Door from the first burnt church (1137), the Romanesque second church (1263), the Gothic Albertine choir (1340), and the Duke Rudolf IV additions (1359), which removed the second church, leaving Stephansdom as it appears today. 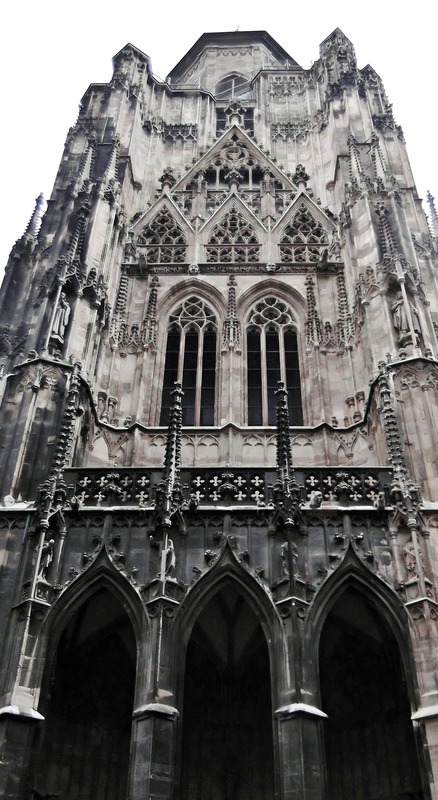 During World War II, the cathedral was saved from intentional destruction at the hands of the retreating German troops when Captain Gerhard Klinkicht disregarded orders from the city commandant to destroy the church. 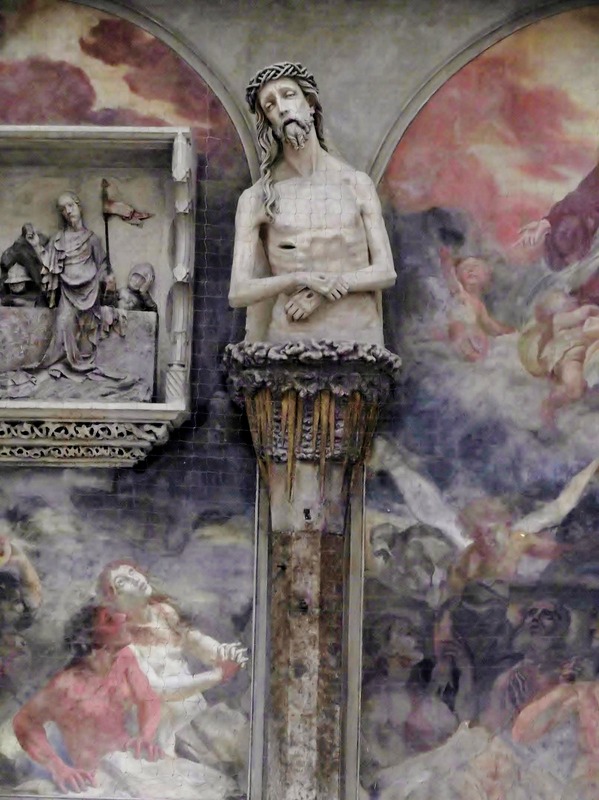 However, on 12 April 1945, St. Stephen’s Cathedral was severely damaged. Civilian looters had lit fires in nearby shops, and the fire flashed over, causing the roof to collapse. 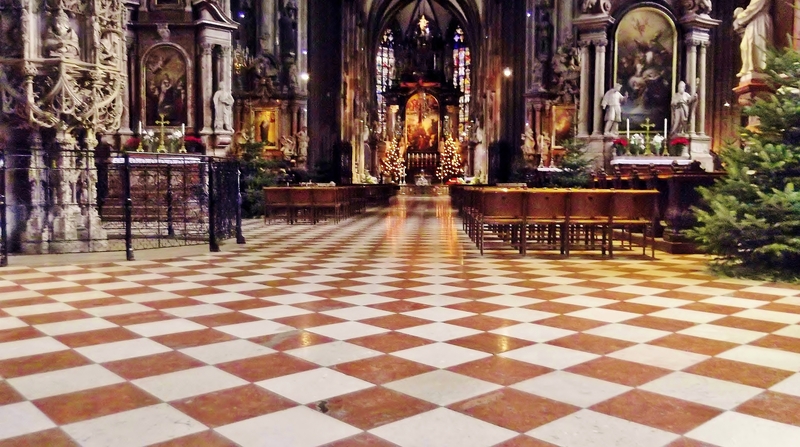 After the war, the Viennese inhabitants collected money to restore the church. Stephen’s square (Stephansplatz), where the St. Stephen’s Cathedral is located (here on the left). West front, along with the main entrance, the so-called Giant’s Door. The name refers to the thighbone of a mastodon that hung over the door for decades. 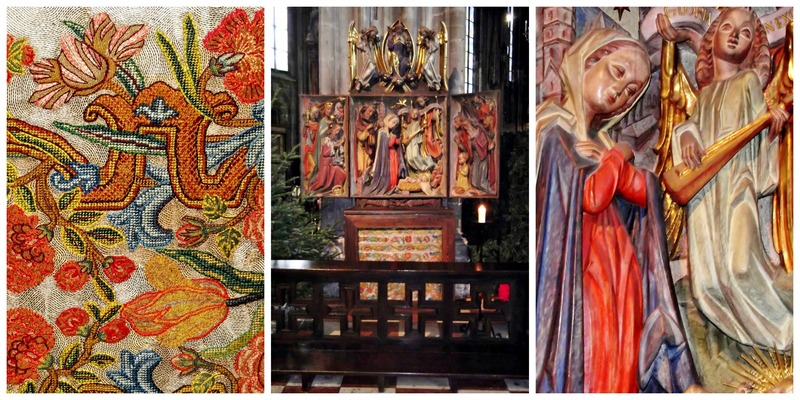 It was found in 1443 during the construction of the north tower. The Romanesque west front and the two towers date from the 13th century. They are the oldest parts of the church. Depiction of the twelve signs of the zodiac. 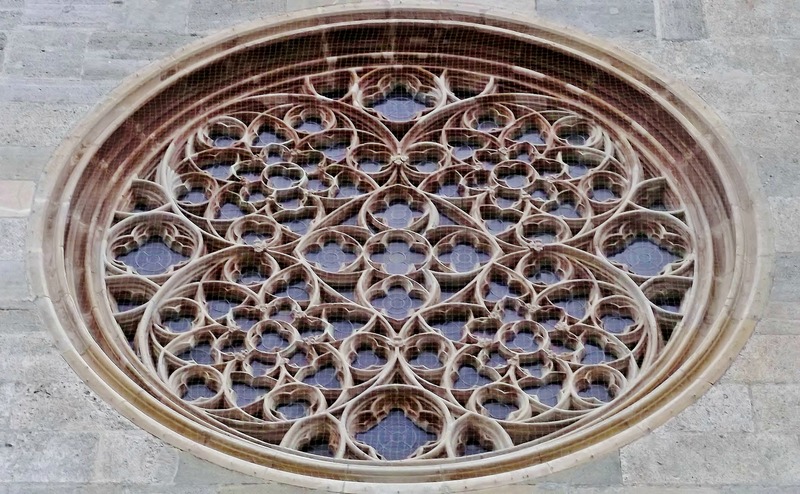 Rose window. The north tower was built in the middle of the 15th century, but its construction was stopped when the work on the cathedral ceased in 1511. The Gothic style had gone out of date, so the north tower was left unfinished. In 1578 the tower-stump got a Renaissance cap, but it is still only half as high as the south tower. 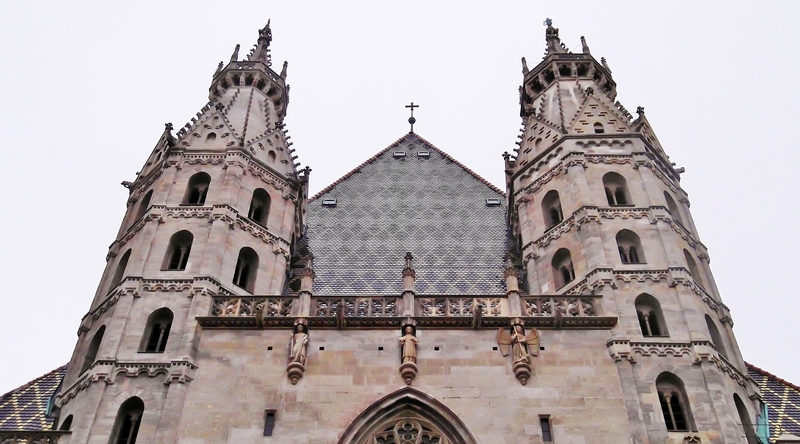 The most famous feature of St. Stephen’s Cathedral is its roof which is covered by 230,000 glazed tiles. 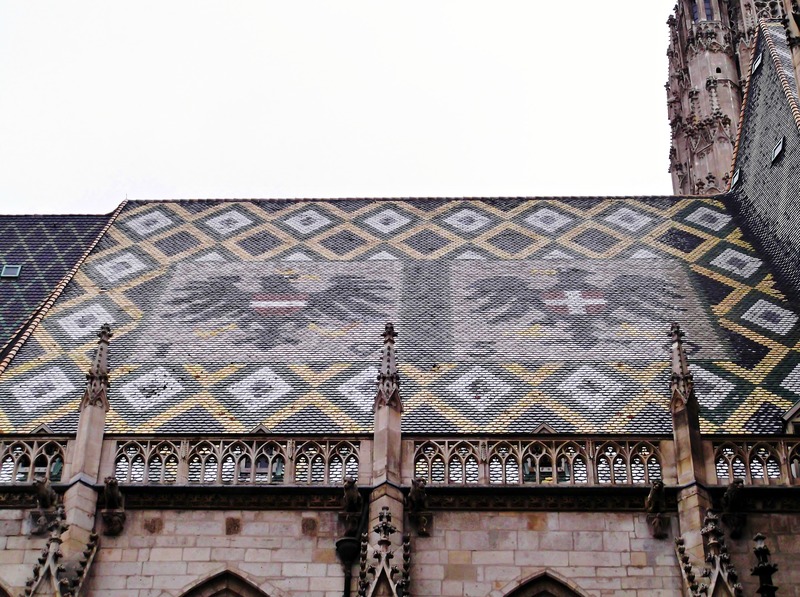 The north roof of the choir depicts the coat of arms of the City of Vienna and the Republic of Austria. 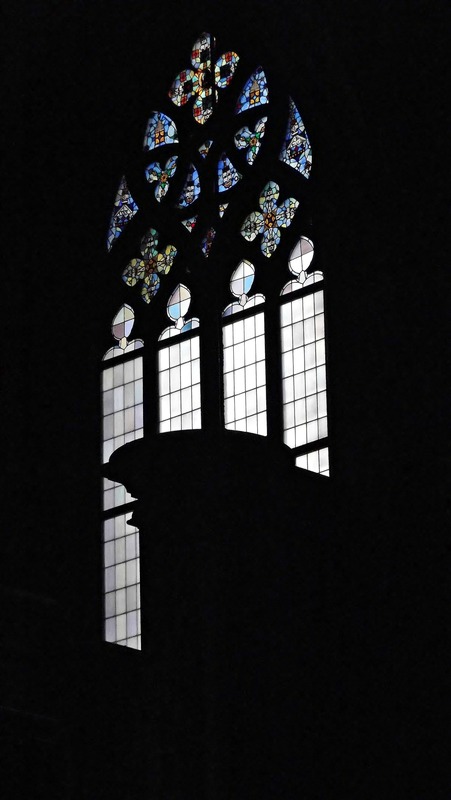 Stained glass windows and the Cathedral’s first pulpit. These are remains from the time where the area outside the cathedral was a cemetery. 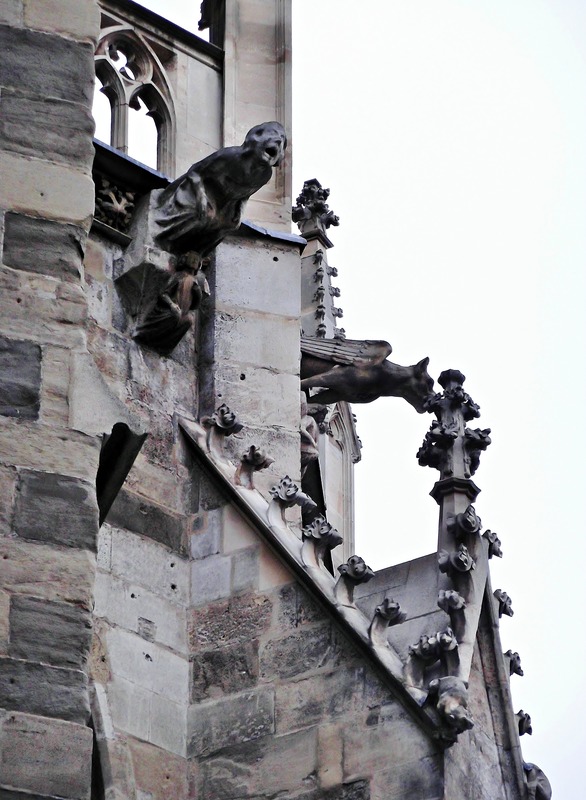 The south tower, which is referred to as “Steffl”, was completed in 1433. 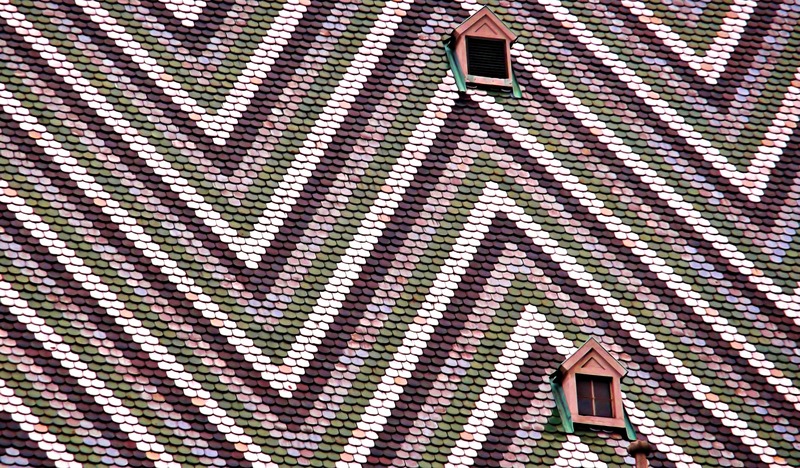 Geometrical patterns on the roof. 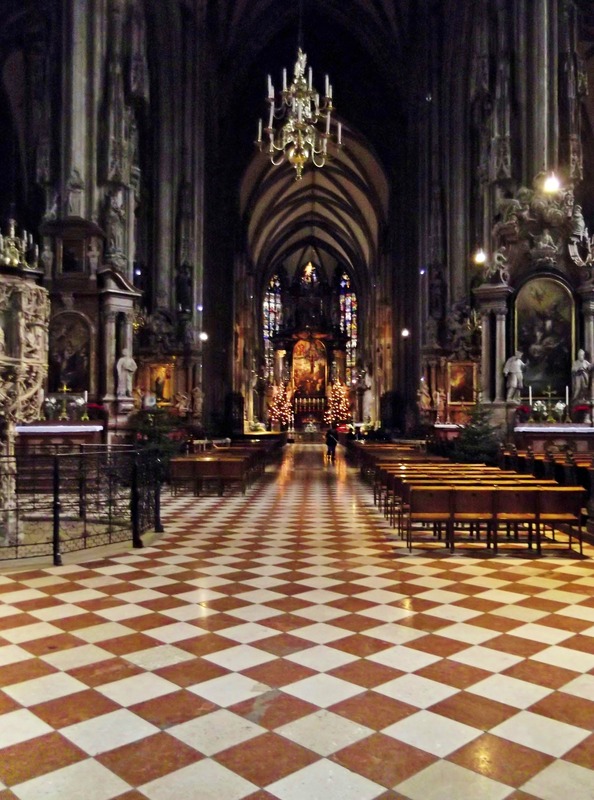 The interior of St. Stephen’s Cathedral is equally striking. A beautifully tiled flooring and pastel-coloured windows create a very special atmosphere. In the 17th century, the Cathedral’s interior was refurbished in a Baroque style. 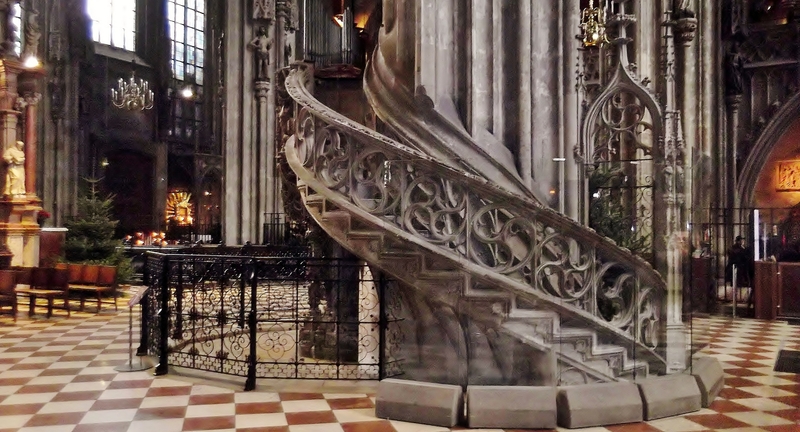 The stone pulpit stems from the late Gothic period, and is attributed to the artist Niclaes Gerhaert van Leyden. The pastel-coloured windows stem from the 1950s. 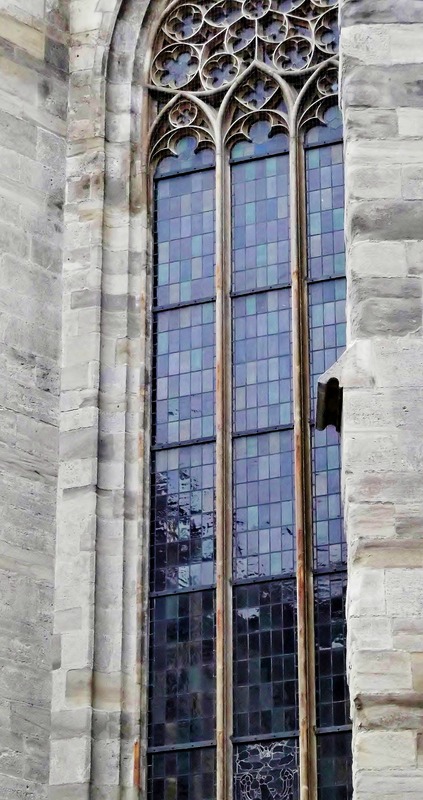 They were a present of the land Tyrol after the original windows were broken after World War II. Spectacular photography. And excellent historical detail. Thank you. What a beautiful place. Your photos are lovely. Thank you, Vienna is really worth a trip! Aw, thank you such much for your compliments! 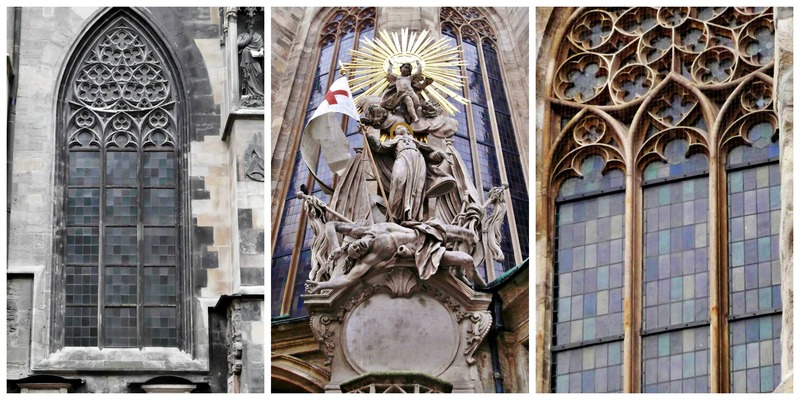 Vienna is such a beautiful city, and St. Stephen’s is a must-see. Even though I know this place well, I hadn’t noticed some of these details before. Did you go down into the catacombs? Unfortunately not. 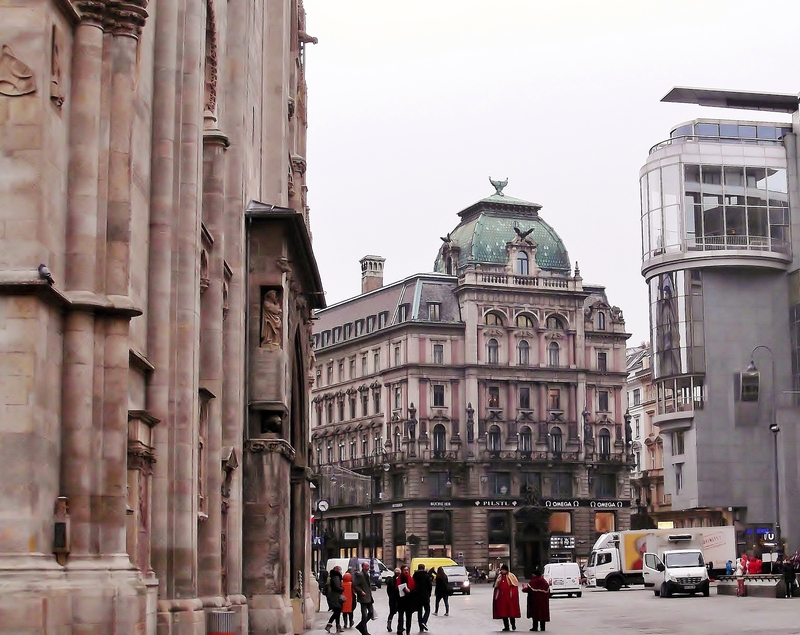 I only had one day in Vienna and I wanted to see so many things, so I was in a constant rush. But I hope to return to Vienna sometime and to have more time then. Such beautiful photography and architecture. Lovely post. Your first photo is perfect for the challenge and I love how you’ve made a whole story from it. I’m curious. Where is the mastodon’s thigh bone now if it’s not hanging over the giant’s door any more? Most of the mastodon’s bone is lost. What was left is now at the Center for Earth Sciences, a department of Vienna’s university. They have a permanent collection. In the 15th century, when the bone was found, people didn’t know that’s a mastodon’s bone. At the time, they thought that Giants used to live on Earth, and all those prehistoric findings were attributed to those Giants. Thanks. That’s very interesting. It makes sense for people to imagine giants when they found massive bones like that. “Depth” Weekly Photo Challenge | The Bohemian Rock Star's "Untitled Project"